About 56,000 applications pending in Strasbourg - ECHR President Raimondi | Russian Legal Information Agency (RAPSI). 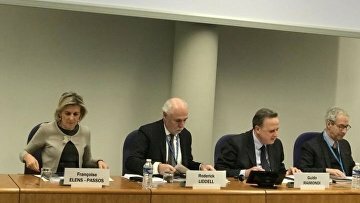 STRASBOURG, January 24 (RAPSI) – About 56,000 applications are currently pending in the European Court of Human Rights (ECHR), the Court’s President Guido Raimondi said during his annual news conference on Thursday. According to Raimondi, pending complaints from Romania, Ukraine, Russia, Turkey, Italy and Azerbajan contain up to 72% of all applications. Nearly 20,600 complaints have been given priority, RAPSI reports from the press conference citing the ECHR President. Over 7,600 applications were communicated to the parties in 2018, 6% more than in 2017, according to the Court’s statistics. More than 62,000 complaints were dismissed. In 2018, the number of applications lodged with the Court in Strasbourg dropped as compared to the previous two years, primarily due to the decrease of complaints from Turkey, Romania and Hungary, according to Raimondi.